We have two species of wild coffee in central Florida. Wild coffee (Psychotria nervosa) and shortleaf wild coffee (Psychotria sulzneri). Both are in the Rubiaceae, or madder, family as is the Coffea arabica that we regularly drink. When one sees the scientific, and common, name thoughts of our morning drink of coffee come to mind as it can make us psychologically nervous, however, it may not be as clear cut as it seems. Nervosa is a botanical term for prominent ribs or veins (in this case on the leaves of the plant). However, psych may not reference mind, soul, or breath, in the case of naming these plants. In a 1969 pubication of Rhodora the author, Pinkley, discusses the etymology of the name. It is interesting to note this because I have not found any documented cases of these plants being used as a coffee substitute other than a few errant comments, on the internet, stating that early settlers used it as coffee. Nor have I found any uses for the berries as a food source by early inhabitants of Florida. 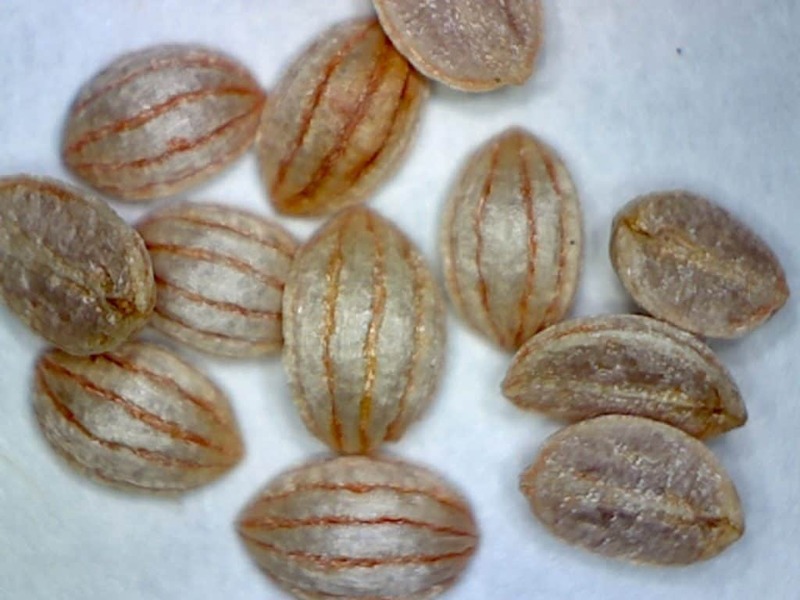 Having processed the seeds myself I cannot imagine it to be very plausible that these small seeds would have been used as a coffee substitute because it would take a huge quantity of fruit. If any readers know of a source for documentation please email me your reference because I would love to know. For native plant gardeners, wildlife enthusiests, and lazy Florida gardeners (like myself) these low maintenance, native shrubs, are a wonderful addition to the landscape. Both species of these plants are lovely as understory shrubs for the shade of live oaks and other shady areas where most plants will not thrive. Whether it is in bloom, bearing fruit, or just showing its deep green foliage, wild coffee is a great landscape plant. Wild coffee is found naturally occurring in Florida hammocks and pinelands from Duval County south to Miami-Dade County. Wild coffee is a low growing, evergreen, shrub with shiny, pleated or quilted, leaves. Most references state that it grows to fifteen feet. I suppose in frost free areas this is possible, however, in Central Florida I rarely see it more than a foot high. The colonies that I have seen in dense shade, on state lands, were very short and no more than a foot in height. The plants I have on my own property are in dense shade and grow to only about a foot. Quite possibly it will get larger if planted in sunnier locations with regular feedings and waterings. I like to plant it around the base of trees and then all I have to do to keep it looking tidy around the tree is to mow up to the edge of the coffee plants and the trees look like I do a lot more maintenance than I actually have to. In the home landscape it grows in dry to average soil moisture. It grows in part shade to deep shade and tolerates drought very well once the plant has become established. It is a fantastic landscape plant for the dense shade beneath oaks and other large trees. It is not salt tolerant. However it can grow near salt air if protected by surrounding vegetation or structures. Leaves are elliptic, opposite, simple, and entire. The leaves are a glossy green and prominently pleated or quilted looking. Leaf size varies from 2 1/2 to 6 inches long and about 2 inches wide. The flowers appear in the summer in stalked clusters. The white flowers are small, about 1/8 of an inch long, and appear in stalked clusters in the leaf axis. 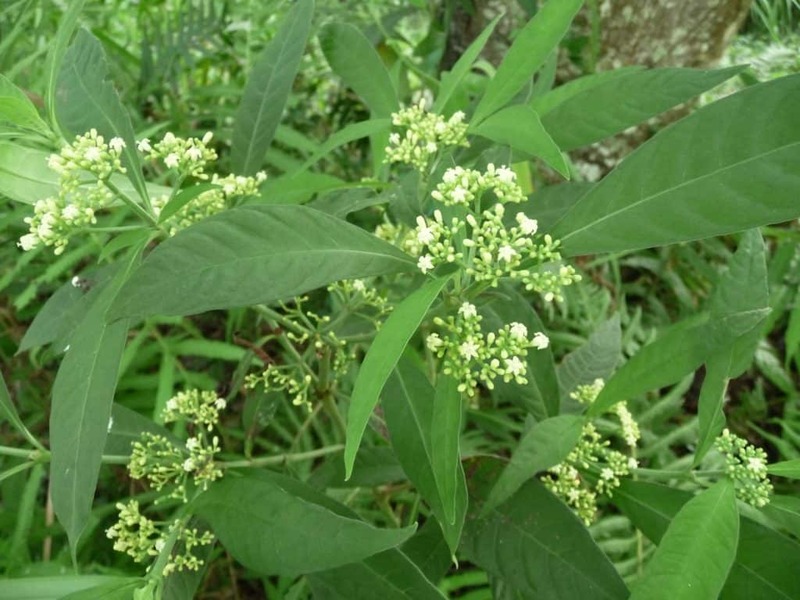 Flowers are not as abundant in the clusters as the shortleaf wild coffee. Bees and butterflies use the flowers as a nectar source. The fruit ripens, in November to December, to a reddish purple with the oblong berries being about a half an inch long. The fruit are much pulpier than P. sulzneri and much fewer fruit per cluster. The fruit is eaten by a variety of wildlife including songbirds and mammals. 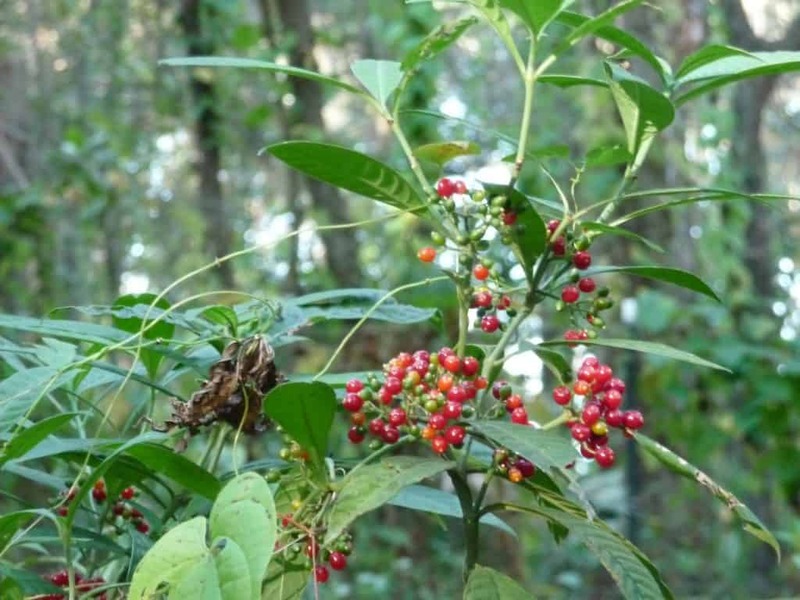 Shortleaf wild coffee is found growing in Florida hammocks and woodlands from Volusia County south to Miami-Dade County. In the home landscape it grows in dry to average soil in part shade to deep shade and grows to a height of about three feet. Most documentation states it grows to six feet in height, but I have not seen any in my area that tall. Just like P. nervosa it will tolerate drought conditions once established, but not salt spray or water. Leaves are elliptic, opposite, simple, and entire. They are a dull bluish green and not as deeply quilted looking as P. nervosa. Leaf size varies from 3 to 6 inches in length and up to two inches wide. The greenish white flowers appear in dense, stalked, clusters in the upper leaf axils. They appear in the summer and are only about a sixteenth of an inch across. The flowers are much more abundant than P. nervosa. The fruit is smaller and more round in shape also, and ripens in varying shades of red and orange. 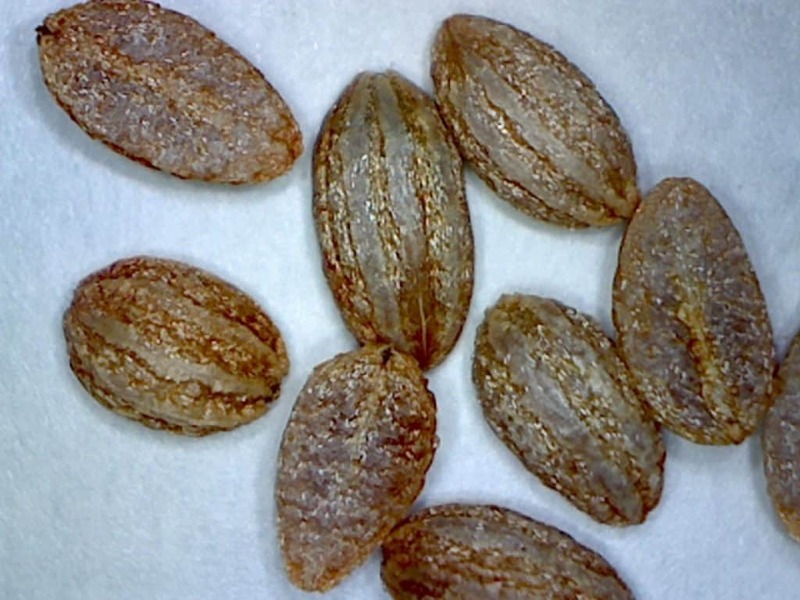 The size tends to be around 3/16 of an inch across and ripens in November and December. The fruit is eaten by a variety of wildlife including songbirds and mammals. 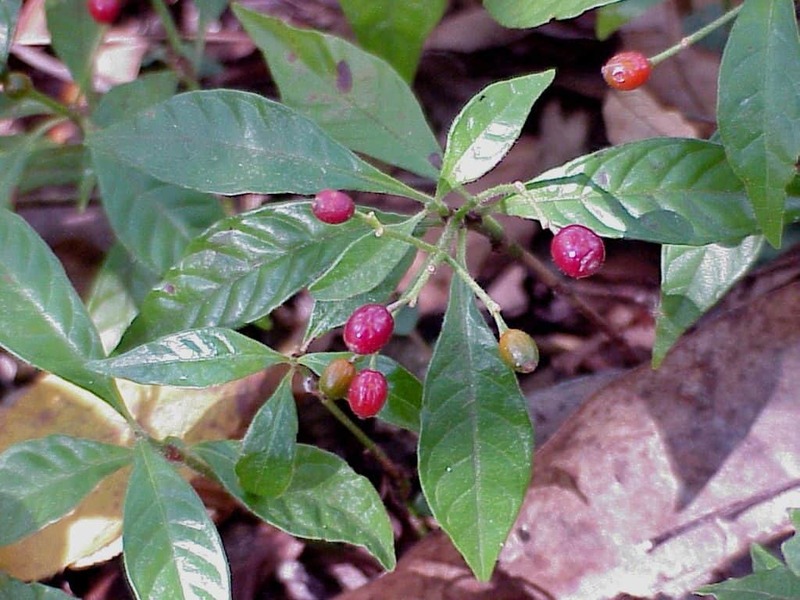 We have one other native wild coffee that is found in Florida which is Bahama wild coffee, Psychotria ligustrifolia, but it is only found south in Miami-Dade and Monroe Keys counties. 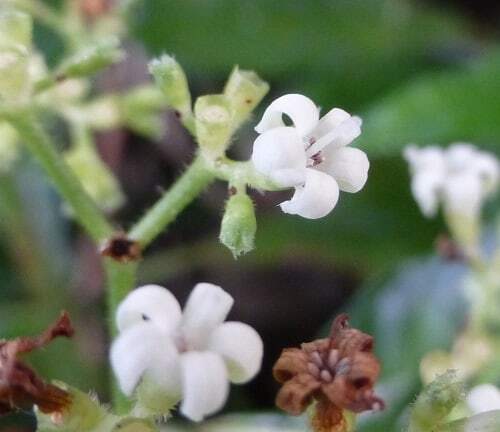 Dotted wild coffee, Psychotria punctate, is also found in the Florida Keys, but is not native.